Barclays, the credit card company, will launch a 'wave & pay' card for low value purchases, such as newsagents, pub, vending machines, in late 2007. For transactions less than £10, card owners will not need to use a signature or a PIN. For purchases over £10, users will be required to enter their PIN (aka Chip and PIN). 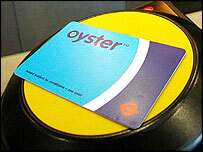 The unique aspect of this annoucement is that the trial will combine the 'wave and pay' card from a bank with the existing and extremely successful Oyster card, the pre-paid contactless card for the London Underground and bus system. Blogging to peak in 2007? ?